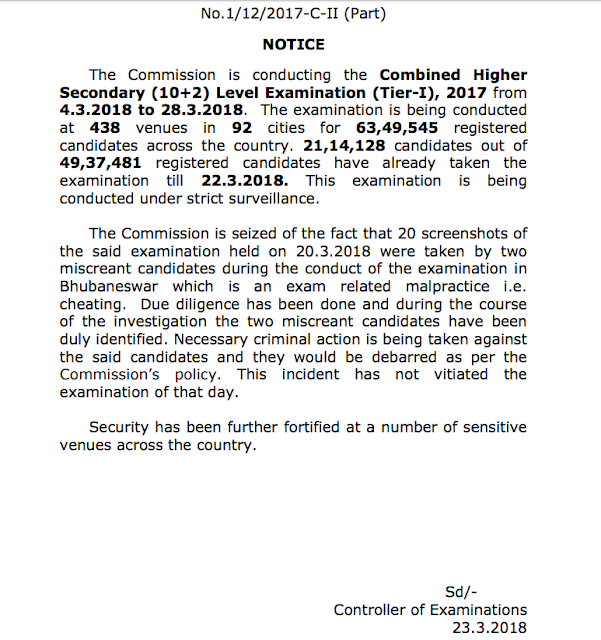 The Commission is conducting the Combined Higher Secondary (10+2) Level Examination (Tier-I), 2017 from 4.3.2018 to 28.3.2018. The examination is being conducted at 438 venues in 92 cities for 63,49,545 registered candidates across the country. 21,14,128 candidates out of 49,37,481 registered candidates have already taken the examination till 22.3.2018. This examination is being conducted under strict surveillance. The Commission is seized of the fact that 20 screenshots of the said examination held on 20.3.2018 were taken by two miscreant candidates during the conduct of the examination in Bhubaneswar which is an exam related malpractice i.e. cheating. Due diligence has been done and during the course of the investigation the two miscreant candidates have been duly identified. Necessary criminal action is being taken against the said candidates and they would be debarred as per the Commission’s policy. This incident has not vitiated the examination of that day. Security has been further fortified at a number of sensitive venues across the country.